Over fourty years ago my father, just out of a tour of duty with the Navy, was living in Washington, D.C, and looking for any opportunity of work. He soon made the acquaintance of a Christmas tree grower in his hometown of Bethlehem, Pennsylvania, and quickly saw just the opportunity. The following December became the first of more than 40 years of providing the Washington, D.C. area with fresh, quality Christmas trees. North Star Christmas Trees has since become the largest independent Christmas tree retailer and wholesaler in the Washington, D.C. area by supplying the public and many profit and non-profit organizations with high value Christmas trees, wreaths, and other decorative greenery. Through 10 locations in the Washington, D.C area, including all local military bases, our goal is to offer fresh, high quality trees that we specially select from North Carolina, Michigan, Wisconsin, Nova Scotia, and Pennsylvania. North Star is still a family run business of local Washingtonians. 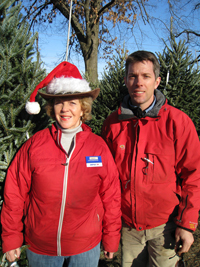 Hugh and his mother Faith Rodell continue to operate under the belief that Christmas is about family and traditions.